An analysis of emergency care costs in the U.S. suggests the actual price tag for visiting hospital emergency rooms may be more than earlier thought. 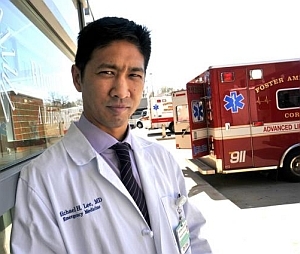 A study by economist turned emergency room physician Michael Lee at Brown University, with colleagues from Brown and Harvard Medical School, appears online in Friday’s issue of the journal Annals of Emergency Medicine (paid subscription required). Lee and colleagues started with current estimates of emergency care costs from the Medical Expenditure Panel Survey — covering individuals, families, employers, and health care providers in the U.S. — conducted by the U.S. Agency for Healthcare Research and Quality, a division of the Department of Health and Human Services. Those data indicate some $48.3 billion was spent on emergency care in 2010, which comes to 1.9 percent of the $2.6 trillion total health care expenditures in the U.S. Using those estimates, the American College of Emergency Physicians has built a public relations campaign around “just 2%” of total health care spending goes for emergency care. The team’s analysis, however, indicates the Medical Expenditure Panel Survey may not be accurately recording usage of hospital emergency departments. Lee and colleagues cite other databases, such as the National Emergency Department Sample, showing the Medical Expenditure Panel Survey undercounts the number of emergency room visits and the number of emergency patients admitted to hospitals. Filling in those blanks, the researchers increased the percentage range estimates of emergency care from 4.9 to 5.8 percent of total health care costs. Lee and colleagues then investigated emergency department spending from a database maintained by a large private insurer. Those data included spending for services from doctors and hospitals for procedures such as imaging and testing, but also uncovered accounting differences between admitted and discharged patients, and only partial accounting for Medicare and Medicaid patients. Adjusting total costs with these data, the researchers estimate emergency care costs range from 6.2 to 10 percent of total health care spending. Much of the problem with calculations of emergency health care costs, say the researchers, is the lack of a standard measure for these valuable services, even after adjusting for inflation. Looking at four major studies over the past 30 years, the team found the average cost of an emergency visit in 2010 dollars to go from $134 to more than $1,000. Computations of variable costs of emergency visits — after accounting for fixed costs, such as equipment and continuous staffing — runs anywhere from $150 to $638. The authors recommend adopting a different approach to calculating emergency room costs based more on accounting principles, called time-driven activity based costing, a method devised at Harvard Business School and applied to health care by Michael Porter and Robert Kaplan, also of Harvard. Activity based costing collects all clinical, administrative, and diagnostic steps experienced by patients, with costs assigned to each activity based on the amount of time spent on each task.